I don’t know why there are so many Korean sushi places in Kingston. I don’t think there is a single Japanese sushi place. They are all Korean run! Usually, I can tell based upon the menu (the presence of Kimchi, dduk dyuk, and bulgogi is a giveaway) but sometimes, you need to rely on an insider who can tell what language it is that they are speaking. The Ben and Jerry’s in Kingston was a really sad shop. Two blocks away, on the prime waterfront walkway, there were two nice local ice cream shops (White Mountain and…. the other one, can’t remember the name) that were always busy. Ben and Jerry’s was tucked away on Princess St. and was usually quite empty. Replacing Ben and Jerry’s is a new place called Sima. It has the ugliest sign that I have ever seen. Unfortunately, the owners did not really repaint the exterior of the store so it remains yellow and red. Yuck. It was so ugly from the outside that I neglected to try it for the first few months. 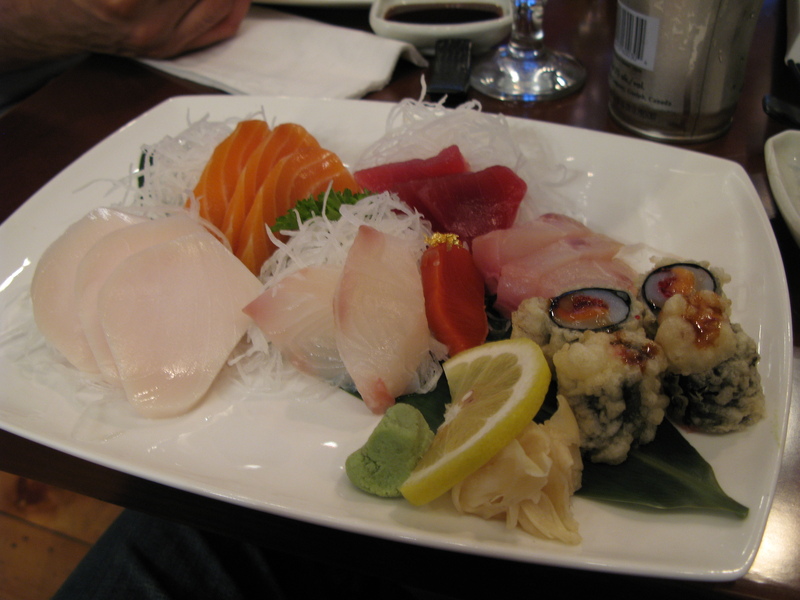 This is the sashimi dinner for $15.99. You get the usual miso soup (very typical, salty, cloudy, seaweedy), the asian vinaigrette salad (I need to learn how to make this damn vinaigrette), and a plate of sashimi. The quality of the salmon was good. The red tuna was very tasty, as was the seared tuna. There was also a really neat squid roll (squid outside with avocado + roe inside). Overall, quite tasty! Look at all the fish!!! I wouldn’t get the sushi dinner ($15.99) as the R:F ratio is pretty horrible (lots of rice, little fish). You basically get some nigiri and 1 roll. The rice tastes pretty good but the sashimi dinner is a much better value. I am very pleased with this restaurant. It still has some things to work out (mostly aesthetic) but the fish quality is good and the price is right. Most importantly, it is a 5 minute walk from my house. Score! I’ve been to Sima about 4 times in the last few months. The quality of the fish is consistently good and the service is much better than Akira. My only concern is the absence of a liquor license but they are proudly displaying on their window that they are applying for LLBO. This is the Chirashi Sushi for $15.99. My god. So much fish. There are 3 pieces of hamachi, 3 pieces of salmon, 3 pieces of red tuna, 2 pieces of butter fish, 2 pieces of tamago, 2 pieces of ebi, 2 pieces of octopus, 2 pieces of fake crab, and…. CAVIAR. All of this was served on a bed of seasoned rice, soup, and a salad. I continue to be impressed with Sima Sushi. It is quickly becoming my favourite restaurant in Kingston. I’ve probably been to Sima around 10 times now. This is what I ate after a long night of inebriation during Halloween. This is the Lobster Tail roll for $14 (yikes) and the spicy tuna roll for $7. Good quality rice and seaweed. The lobster roll was a bit unremarkable, essentially battered and fried lobster wrapped in avocado and seaweed. The spicy tuna roll was pretty tasty but again was run of the mill. The quality of these two rolls was good but I much prefer their sashimi. Sima is the best. Easily the best. Great sushi. Great people. Daniel and June are fantastic. Cassandra and April are great also. I can’t believe how often I come here. 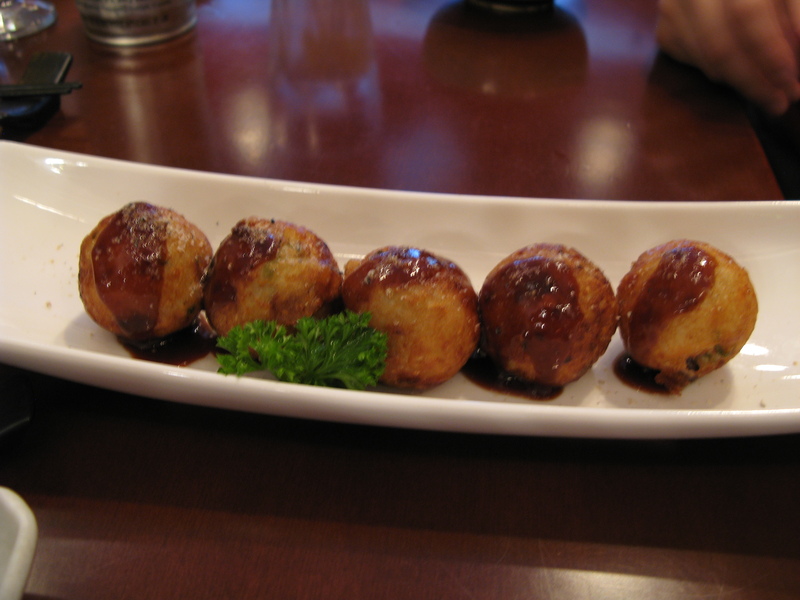 The takoyaki (baked gluten balls filled with octopus). Pretty tasty but it really needs bonito flakes to make it complete. The double torched roll. So well made. Tightly packed, tender fish, and a nice glaze on top. The sashimi dinner deluxe for $19.95. You get so much fish! Butterfish, salmon, red tuna, another type of tuna, hamachi, and a deep-fried squid roll that has been battered and stuffed with vegetables. I keep coming here. And it is getting really busy. People are starting to catch on to this gem. 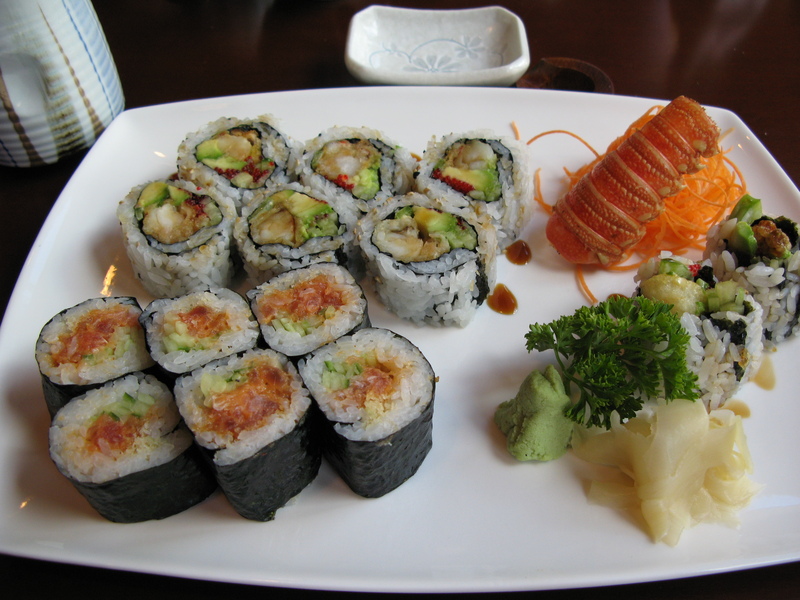 Sima Sushi, 66 Princess Street, Kingston, ON, (613) 542-8040, no website. ~ by Russ on September 1, 2009. I completely agree! I checked out their takeout menu one day and was surprised to see that the menu was quite small–the focus was clearly on the sushi. I was thoroughly impressed by the freshness of the fish, and I am impatiently waiting for my next visit! It is weird. How can Akira and Sima acquire such fresh fish but Ta-ke, Asha, Sushi Q all cannot? It puzzles me. I am actually happy that they haven’t expanded their menu to the scope that Akira has. It allows them to focus more on the fish, which they do well. We don’t need another place in Kingston that is a Korean/Sushi blend! Great place to relax and enjoy. The fresh sushi that Daniel prepares and his lovely wife June serves is second to none , the quality and pride one sees in how both believe in caring for the customer. I will add this fine restaurant to my short list. The other day, they gave me some Edamame on the house. I was very pleasantly surprised. This is the kind of Korean hospitality that I love! You show them some consistent patronage, they are generous back to you! Sima sushi is a phenomenal restaurant! I’ve gone at least 8 times since September, and each time is better than before. I usually order the Sashimi dinner and never can understand how they give so much good quality fish for such a fair price. I’ve tried a couple of their rolls, the spicy salmon and tuna are both good, but avoid the green dragon roll (its just a california roll with avocado, no tempura). I cant wait until i get to go again! I agree that SIma is the best in Kingston. I look forward to reading more Kingston reviews from you. I moved here while my husband finishes med school, so it has been an adjustment for me since it’s such a small city. I miss big city dining! saw this in Japan, any local place does this kind of sushi oyogu hone? The only best Japaneses restaurant in Town 4 sure ! Service there was good. However, I got sick twice after I ate spicy salmon, and rock star roll recently. I didn’t have any problem and would love to go when it first starts its business. It seems the fish is not fresh anymore. I don’t think I will visit Sima again. Sorry that you had a bad experience. I wouldn’t hold it against them though. I’ve gone there 20x in the last year and I’ve never been sick (and have eaten some pretty challenging pieces, Sea Urchin for example. You haven’t reviewed them so I’m not sure if you’ve been there, but two of my favourite sushi places in Kingston (at least as good as Akira) are Sushi Ya and Izumo, both on Princess. Worth a look if you haven’t tried them already. Thanks for the tips! I’ve been to both of those joints but I probably didn’t order the right dishes. Sushi-ya in particular has gotten a lot of praise from my peers but I find it pretty bland, especially with respect to fish quality. What do you usually get so I know what to order next time? It depends. If there’s a special on the board that sounds good, I’ll order that, but usually I like to order from the “special roll” section, i.e. caterpillar roll, green dragon roll, etc. 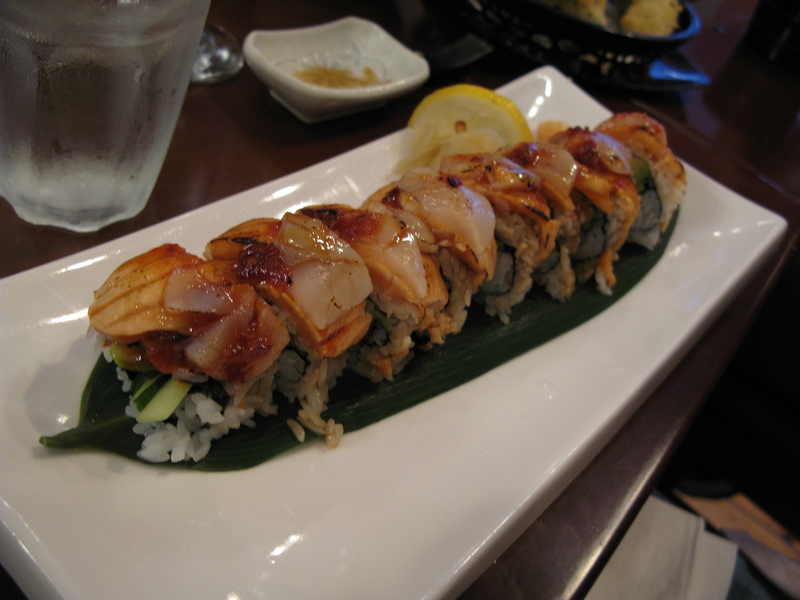 Both Izumo and Sushi Ya execute these types of rolls very well, particularly on presentation. I will admit that for nigiri or sashimi they’re nothing particularly special, though. Akira is probably still my favourite there, although I haven’t tried Sima yet. Don’t miss Sima. It has got fantastic service, reasonable portion sizes, and a good price. The chirashi sushi in particular is quite good. Sima is good. I visit there often when i am downtown. There is this tiny resturant with about 5 tables, called Sapporo’s… The food is quite amazing.. i suggest you try it. Glad you like Sima. It really is a sushi gem in the heart of downtown Kingston. Given how much trash is around there (ahem Take, Asha, Sushi Q), it really shines. I just went to Sima, per your recommendation for a large sushi, sashimi and maki platter and it was fantastic. Hailing from the west coast, I’m used to inexpensive, excellent sushi and this place was such a pleasure to find. I will most definitely be back!!! Glad you liked Sima Kate. I really jumped for joy when I saw a great sushi restaurant open literally 10 minutes from where I live! Best restaurant in Kingston, period. I have serious cravings for this restaurant over holidays, visit Sima at least once a week, and think Dan and June are the sweetest people I’ve met in Kingston. My favourite recommendations (in order): Rockstar, Love Love Salmon, Firecracker, Crispy Crunch, Double Salmon. Go for brown rice (extra 1.50 I believe) for a slightly nuttier and healthier taste 🙂 And if you ever want something greasy – the Salmon Sushi Pizza never disappoints! And get the plum wine, or two! Mmmmm plum wine. So tasty. I think I could drink a whole bottle of this. A perfect combination of tartness and sweetness.